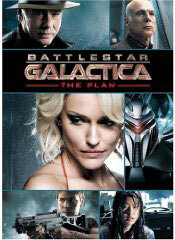 ‘Battlestar Galactica: The Plan,’ is a direct-to-DVD movie that was also released on blu-ray. Before discussing the film itself, I want to share news of a contest to “Have Dinner with the Admiral” that is running through November 20. This contest provides a chance to have dinner with series star and the director of the film Edward James Olmos. The details and the entry form for the contest are at http://www.ugo.com/battlestarcontest. “The Plan” tells the epic story of the destruction of the 12 human-inhabited colonies and the resulting journey to find earth from the perspective of the Cylons who created that destruction and continued their campaign against mankind. The Cylons are cyborgs who evolved to the point that that they became identical to humans and developed their own culture and society. A consequence of this evolution was a conclusion that the Cylons were superior to the humans who they were built to serve. Fans of the modern Galactica series already know the story of the attack and the subsequent long journey, but “The Plan” retells this story from the perspective of the Cylons and adds numerous new insights. The more significant ones are the exact reasons for the initial attack and the continuing war against the meatbags. The film is interesting as well because it recreates significant events from the series from the Cylon perspective and because it shows how close interaction between Cylons and humans during the quest for earth affected the Cylons. An example of both of these elements is a scene in which a Cylon tells a Cylon leader how she botched an assassination assignment. Another good aspect of this film is that it provides a good condensed version of this series that has a great deal of lore. The special features in the set on the making of the film and the background of the Cylon characters also help with this. As clichéd as it sounds, the series and the film are very relevant in a society in which many people perceive others who look like them to be enemies with an ability to cause a great deal of harm. Additionally, there have been cases of people who have traveled to America for nefarious purposes coming to like our people and way of life. My primary criticism of the film is an aspect that will likely appeal to the teen boys that comprise a large portion of the “Galactica” audience. There are several scenes of naked woman that really are not relevant to the story and seem to be there merely to distinguish the film from the series and demonstrate that you can show naked boobies on direct-to-DVD films. The blu-ray version provides good sound quality and very crisp video for outdoor and space scenes; many of the scenes that were set inside space ships were rather grainy; I suspect that this was done purposefully to continue the tradition of the series of a harsh and realistic look.